Welcome to another “Baking Partners Challenge”, this month we are deciding to make homemade puff pastry. I was searching for a new recipe to try with puff pastry as I have tried vegetable puffs already. Earlier plan of mine was to make Danish pastry, but then came to know that it requires a yeasted puff pastry just like croissants. So skipped that idea and decide to make this Plantain Jalousie with homemade puff pastry. This month challenge was suggested by Sangeeta Priya of Nitha’s kitchen; she made homemade puff pastry without yeast. I have earlier tried making puff pastries with yeast; I have made croissants, pain au chocolate and cronuts. So I decided to try puff pastry without yeast for first time. Next in my list is rough puff pastry, but that may not be in the near future as it has tons of butter in it. As any other puff pastry you need to first make the dough and then incorporate butter , fold and turn several times to get layers of puff pastry. All puff pastry making procedure is same when comes to folding and turning the dough, more you fold and turn more you get the layers. Once puff pastry is made next step is to make a dish with puff pastry. I decided to settle on Jalousie, which is a fusion of a turnover and a strudel. 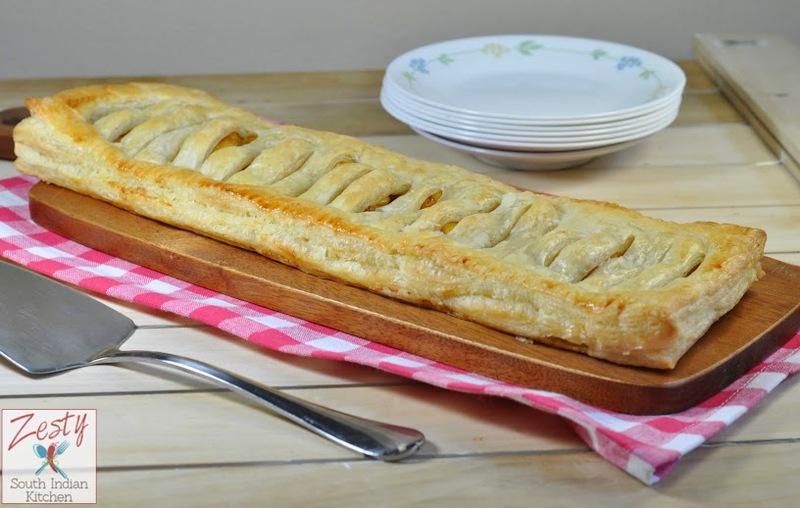 If you don’t know what a jalousie is, it is two rectangles of puff pastry with a fresh fruit filling in-between; the edges of the pastry are pinched together or crimped with a fork. Before baking, slits (“slats”) are cut into the top crust that allow it to steam and also create a glimpse at the attractive filling between the slats. One thing to make sure with this pastry is the fruit filling shouldn’t be very juicy or the bottom crust will become soggy. The solution is to precook the fruits and reduce their juices. The filling can be made and stored in a covered container in the refrigerator for up to two days. I had some plantain in my hand which needed to be used, so used a butter roasted plantains with cinnamon and little sugar as my filling. This is inspired from my mom‘s ghee roasted plantains. First day I made puff pastry and next day made filling and jalousie. Trust me it is delicious treat with loads of calories. We can have them in moderation. 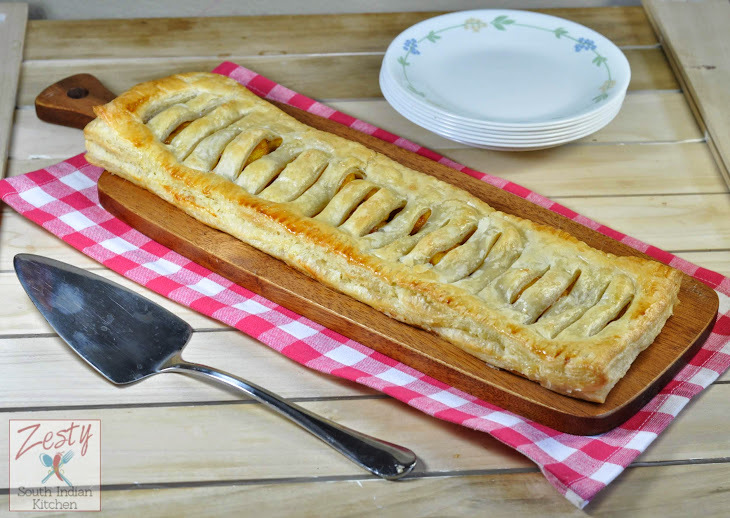 You can make plantain jalousie with store brought one too, it is easy dessert idea for any gathering. Serve with or without ice cream. Here comes the recipe for both homemade puff pastry and Jalousie Please take look at other baking partner’s recipes too. If you want to bake with us n ext month please shoot me a mail. Delicious dessert with ripe plantains and puff pastry. Sandwich the softened butter between two sheets of parchment or waxed paper. Flatten with a rolling pin as evenly as possible to form a roughly 4x5-inch rectangle refrigerate while you make the dough. In a medium bowl, combine the flour and salt. Pour in the melted butter. Gradually add water, and mix all the ingredients with your hands. Add more water, if necessary, to make a soft dough. Knead until you have smooth dough, about 1 minute. Dust the counter lightly with flour and lay down the butter and dough envelope, seam side up. Lightly dust the top with flour and roll out to form a 12x15-inch rectangle. Don’t turn the dough as you do this. If any butter breaks through the pastry, just dab it with a little flour and carry on. Lift one short end up and over the central portion of pastry, and then fold the other end over the central part, as if you were folding a letter. Press the edges down lightly with a rolling pin to seal. Turn the pastry clockwise 90 degrees. What was the top edge of your pastry will now be on the right. Mark the top left corner by pressing your finger into it. This is the first “turn.” The pastry and butter should still be firm enough to roll another turn, but if it is very soft and the butter is on the verge of oozing, put it on the baking sheet, cover, and chill for 20 minutes. For your second turn, dust the work surface again with flour and put the pastry on it, with the marked corner at the top left. Dust with a little flour and roll the pastry out again, without turning the dough, into a 12x15-inch rectangle. Fold the pastry as before and turn it clockwise 90 degrees. Mark the top left corner with 2 indentations of the finger (this is to remind you that you have completed two turns). Transfer the pastry to the baking sheet, cover, and chill for 30 minutes. Wrap the pastry in plastic and chill for an hour (or overnight) before using. When to you are ready to bake let the pastry sit at room temperature until pliable before rolling, about 10 minutes. In a large bowl, toss the plantain with the brown sugar, cinnamon and mix well. In a 12-inch skillet, melt the butter over medium heat. Carefully add the plantain mixture to the skillet; with a heatproof rubber spatula, scrape all the sugar and spices from the bowl into the skillet. Stir the plantains to coat them with the butter and then spread them in a fairly even layer. Cook, stirring gently with the spatula every few minutes (try not to break the plantain slices), until the plantains are tender but not mushy (taste one) and still hold their shape about 3-5 minutes. Scrape the plantain into a wide shallow dish or onto a baking sheet to cool completely before assembling the jalousie. Line a large rimmed baking sheet with parchment. In a small bowl, make an egg wash by beating the egg with 1 Tbs. water until well combined. Unfold the puff pastry dough on a floured surface, and gently pinch together any seams that have split. With a floured rolling pin, roll the dough into an 11x14-inch rectangle. With a sharp knife, cut the rectangle in half lengthwise to form two 5.5x14-inch rectangles. Use a long spatula to help you move one of the dough rectangles onto the parchment-lined baking sheet. don’t crease the fold. Using a sharp knife, cut 1-1/2-inch-long slashes at 1-inch intervals along the folded side of the dough; leave at least a 1-inch border on the remaining three sides. Do not unfold the dough. Using a long spatula, gently lift the folded strip and position it over the fruit-filled dough rectangle, matching up the straight edges. Slash along the folded side. Gently unfold the top piece of dough and stretch it over the filling, matching the straight edges all the way around the perimeter of the dough. Press the edges gently with your fingertips to seal the dough, and then, with a fork, very gently crimp the edges of the dough all the way around the pastry. Unfold the dough over the filling. Chill the assembled jalousie for 15 to 20 minutes. Meanwhile, position a rack in the lower third of the oven and heat the oven to 400°F. Right before baking, brush the top of the jalousie with a very light coating of the remaining egg wash (you won’t need it all) and sprinkle with the demerara, turbinado, or granulated sugar. You amde it very well Swathi, love the banana stuffing!!! Love the plantains and love the vented shape you used! beena stephy recently posted…Chickpeas- brinjal curry / white kadala vazuthananga curry. I always wanted to make puff pastry dough at home. Was reluctant to do so since I had no idea about the consistency. This is a great recipe, thank you so much. Will try it soon! wow fantastic jalousi made with home puff pastry 🙂 it looks so perfect and wonderful clicks dear !! Puff pastry has been in my list too since long.yours look perfect.. Plantain jalosie looks too tempting..
Gloria recently posted…Creamy Chicken Hareesa/Alisa. I’ve never tried my hand at homemade puff pastry, but I look forward to trying it soon, with your encouragement. Plantains? YUM. Yum, I made homemade puff pastry once and it was so awesome! 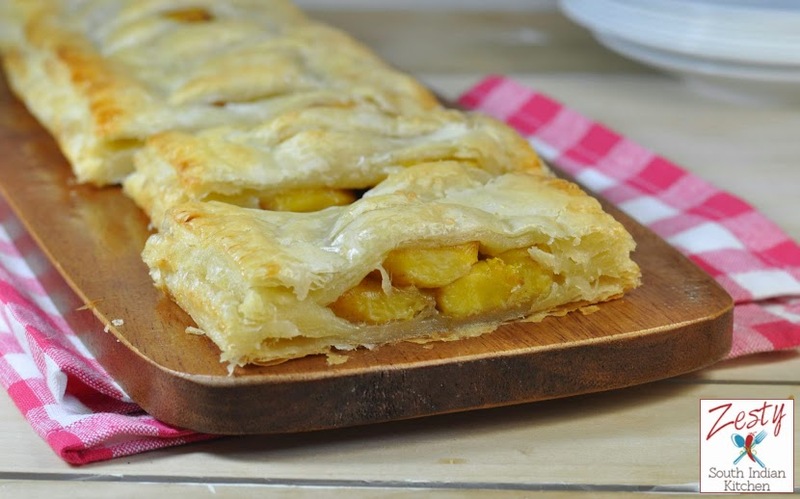 Your Plantain Jalousie looks so lovely and tempting Swathi! Can almost pull put a piece and take a bite. I wish my puff pastry turned out that beautiful but i will keep trying. Looks real good ! very beautifully done ! wow, this looks absolutely amazing, can’t wait to try this!